A milelong ice dam formed near downtown Kent over the weekend, flooding homes and forcing the Kent School, a private boarding school, to close for the week. 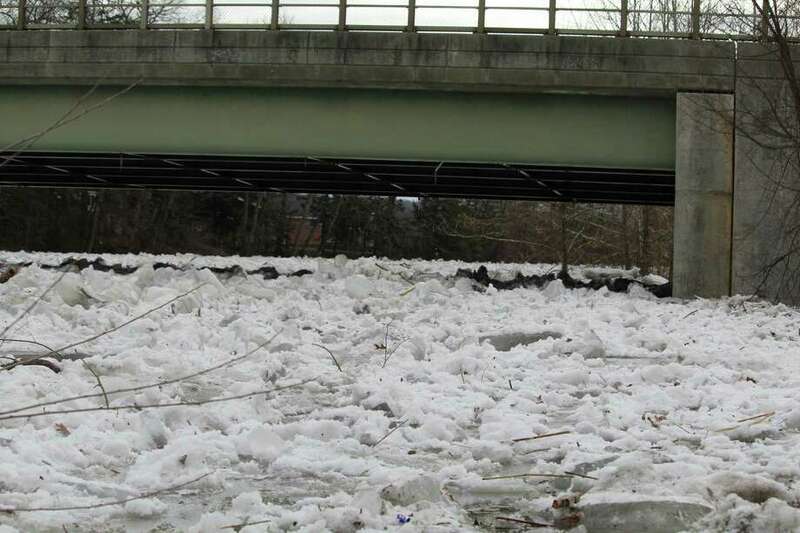 KENT — The ice dam that formed in the Housatonic River over the weekend, flooding Route 7 and forcing evacuations of four homes, was still growing Monday, reaching a mile in length and a thickness of 12 feet. The Kent School, whose campus lines the river bank west of town, sent all its students home for the week after the water flooded several buildings. Besides the four homes already flooded, another 22 are potentially affected, said state Rep. Brian Ohler, who was in Kent over the weekend helping town officials marshal their resources. One of the nearly 600 Kent School students making impromptu living arrangements Monday was Tyler Kim, a sophomore, who waited just outside the campus for a taxi Monday afternoon. Kim, 17, plans to stay with his sister in New Haven until school reopens. He said he was lucky to have a sibling close by, because friends from far-off countries are unsure whether they should go home. “They’re not really sure how long this will last,” Kim said. Ohler said water levels upstream of the dam, which formed south of Bridge Street near downtown Kent and extended north past Kent Furnace, were on the rise Monday afternoon. And there is little officials can do other then ready resources such as boats and vehicles, Ohler and Adams said, which is the reason they declared an emergency. “It’s impossible to stop a river,” Ohler said. A second, smaller dam formed south of the town center, above Bull’s Bridge. Nearly four miles of Route 7 remained closed Monday, and will likely be closed for the week, Ohler added. And it happened quickly, Ohler said. From 3 p.m. until 4 p.m. Saturday, Route 7 went from passable to under four feet of water. Residents affected are staying with friends and family members, although town officials have opened emergency shelters. Workers with the Department of Transportation will inspect the roadway when it’s clear of ice and water, to “better determine its strength and integrity,” authorities said. Authorities urged drivers to stay away from Route 7 and Schaghticoke Road. Traffic north- and southbound was rerouted to South Kent Road. Ohler said several days of warmer weather — around 50 degrees, without rain — will be needed to create a “slow thaw” that would avoid further flooding. But according to the National Weather Service, that scenario likely won’t occur. Temperatures won’t go above freezing through Thursday night and the town is under a winter storm watch from Tuesday into Wednesday morning. Dirk Perrefort contributed to this report.